Yesterday afternoon we were very excited to find out what happened to George's Grandma when he gave her her medicine. But, Miss Grimes sneakily stopped before we could find out what happened. We then had to imagine what would happen to Granny. Some of us thought she would shrink down to the size of a mouse others that she would turn in to Super Grandma! We then decided to create our own Growing Granny whose hair will grow and grow. First, we took paper pots and designed an horrid Granny face on the front. Next, we filled the pot with wet kitchen roll and cotton buds, then squished them down. 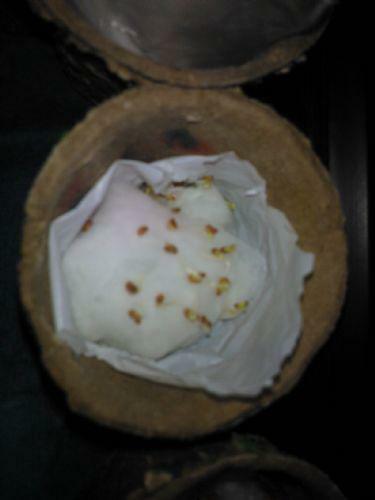 After that, we sprinkled curly cress seeds on top of the cotton buds. We can't wait to see how long Granny's hair grows, and maybe even make cress sandwiches with it! Yum Yum! Keep checking back to see how long Granny's hair will actually grow and what actually happened to Granny in the story! Our Growing Grannies have started growing! It has only been 4 days and our cress has already started to sprout! Update- we had Granny sandwiches (egg and cress).